A few days back I was running late in the morning and decided to forego my customary cup of tea. BIG MISTAKE. I suffered a killer headache the entire day. I couldn’t wait to get to my bed and lay there forever. 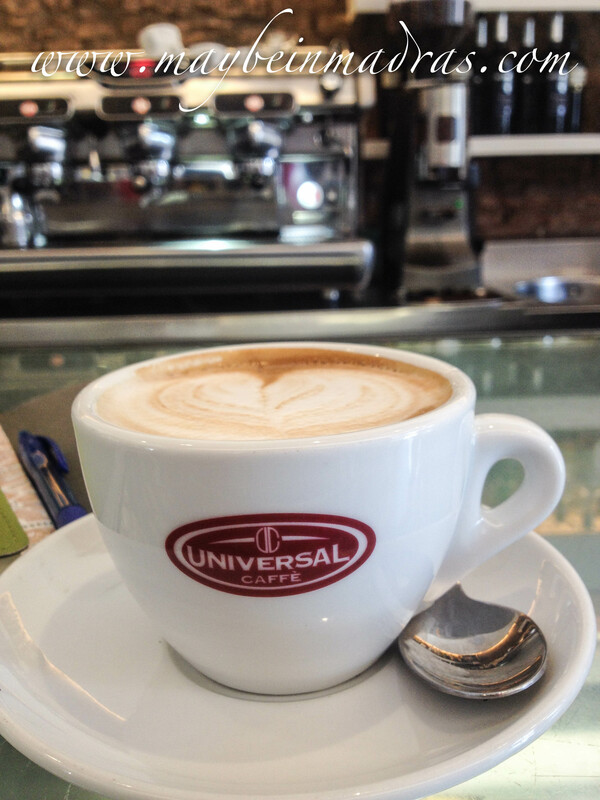 This headache got me craving the smooth cappuccinos I used to drink on the daily when we visited Rome. We stayed in a tiny, charming hotel near Piazza Navona. The area was surrounded by Italian coffee shops, situated away from the touristy areas. There was this one small shop that was part grocery/part cafe where the barista made the most perfect cups of cappuccino for 1.25 euros. Most places in Europe charge extra for a “sit-down” cup of coffee. But if you stand at the bar, its considerably lesser. Every morning we’d walk down to this cafe to get our shot for the morning and bask in that caffeine glory. This coffee was on my mind throughout the week. I HAD to get a similar cup in to my system. So I dragged Jay to Chromatic Coffee in . And I finally had my luscious cappuccino, Although it wasn’t close to the Italian counterpart, it did the job it was meant for. You lucky lucky girl! I have been craving good coffee for a long time now! Nothing is as good as filter kaapi though! Those 1 euro capuccinos in Italy almost ruined cappucinos for me! They cost twice as much elsewwhere and are nowhere as good. Sigh.